Yesterday I was finally able to get a chance to try my hand at looking for a census image from the 1940 Census. I had been waiting due to the fact that for some reason the universe was against having any provider with working access to any states where my family was located at the time. What a wild ride it was early in the week huh!?! Then I realized that MyHeritage.com finally had up one of my states. The lovely Idaho, where much of my family resided during that time frame up until even today. I quickly did a search for what I could find in Idaho Falls where there were Bybee and Dennis family waiting to be found. I quickly stumbled upon a great great uncle, Garland Dennis living with his wife Thora and son Denny. The user interface was nice and easy to use, but I needed to be able to narrow things down a bit to locate more specific Enumeration Districts, rather than looking through the entire town. I got on the stevemorse.org website and looked for the Unified 1940 Census ED Finder where I could use the Enumeration District (ED) from the 1930 Census for several of the families that I was looking for and have it converted to the 1940 ED. Then when I clicked on the link for the ED I realized - without thinking about it at first - that it took me to the National Archives site which I hadn't heard was now working. Yeah! This allowed me to find the Ephraim and Lucy Jensen family (my great grandparents living with my grandmother and great aunt) in Boise, Idaho and then I decided to try for Utah and found another set of great grandparents David and Jessie Newman. 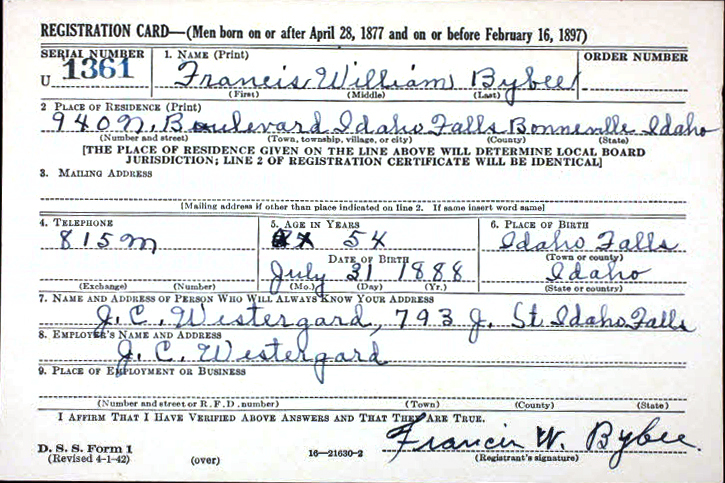 Things were moving along quite well until I decided to head back to Idaho Falls to seek out Francis and Winnie Bybee (more great grandparents). I used the same converter for their ED from 1930, but didn't find them or any of their neighbors in the "translated" 1940 ED. I wondered if I would get any different results by going by their address on North Boulevard (also from the 1930 Census). When I looked at the corresponding map and added some of the surrounding streets I got a few other EDs, but still no luck. 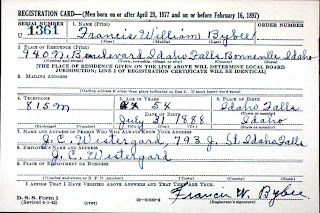 I thought maybe I had the address wrong somehow, and so I looked at Francis' WWII draft registration card which showed me that in about 1943 he was exactly where I thought he should be. 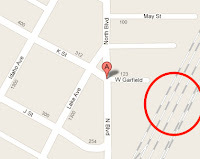 I then noticed on the map for that address that they were near the railroad tracks (see circle in red). 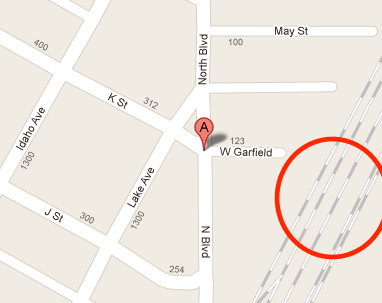 I thought, "It sure would be nice if you could add railroad tracks as a nearby street." Guess what!? When I looked again there is an option to so and when I did I got all of the EDs that I had previously checked, and a new one! Looking into that ED I was able to quickly locate them at the same address that I expected them to be at in 1940 with two of their sons living with them and another married one next door. Found at last! © Copywrite 2011, Bret Petersen. Simple theme. Theme images by sndrk. Powered by Blogger.